The question of seasonality and how it correlates with diarrhoea has come up a number of times. Our last blog post got Rohit thinking about this a bit more. 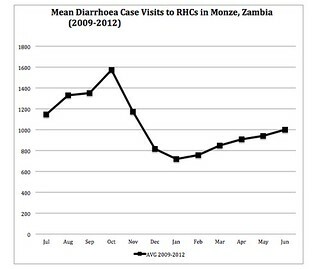 There are few studies, if any, that have looked at the seasonality of diarrhoea incidence in Zambia. This is a global gap in the research because of the complexity of the causal patterns of disease and the regional nature of climate change. Plus, the extent of climatic influence is highly dependent on the pathogens, as well as the water and sanitation context. Needless to say, evidence of direct links between disease and climatic patterns is scarce and varied. Some studies have found that rainfall doesn’t affect transmission of specific diarrhoea pathogens (Zhang et al, 2007), while others found that low levels of rainfall are associated with higher incidence of diarrhoea (Singh et al, 2001). Our lack of understanding in this area is a concern given that climate change is an important health determinant for people, particularly in vulnerable areas (Confalonieri et al, 2007; Patz et al, 2005). For example there are growing concerns that climate change could lead to increased mortality from malnutrition because of drought and crop failure (Schmidhuber and Tubiello, 2007), diarrhoea [McMichael et al, 2004; World Health Organization, 2004], respiratory diseases (Beggs and Bambrick, 2005), and vector-borne diseases like malaria (Tanser et al, 2003). 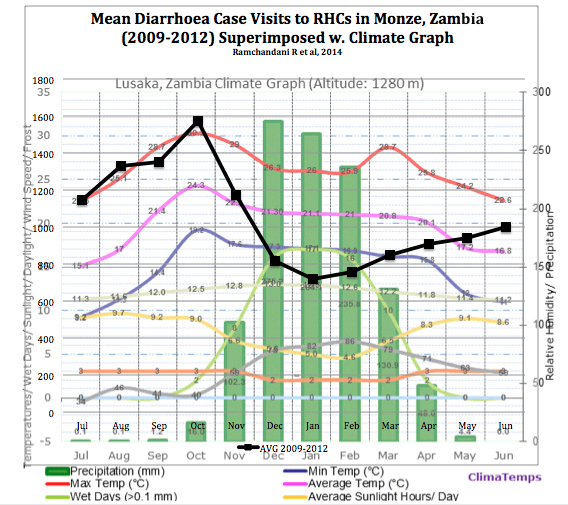 Further to our previous blog post, Rohit has superimposed the graph that was included on diarrhoea cases reported at Monze health centres with a climate graph for Zambia. Take a look at the trend illustrated in the graphs below. It shows a very clear inverse relationship between precipitation and diarrhoea incidence. The diarrhoea incidence pattern was very similar for the other three COTZ districts (Katete, Kalomo and Petauke). Rohit looked into the research in this area a bit further and found some potential explanations. 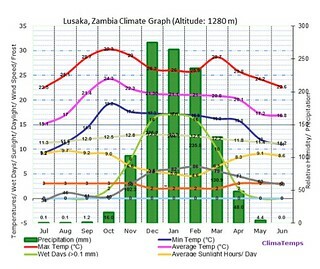 One recent study showed that low rainfall in the dry season increases the prevalence of diarrhoea across Sub-Saharan Africa (Bandyopadhyay et al, 2011). When/where water is scarce the prevalence of diarrhoea increases due to consumption of unsafe water and poorer hygiene practices (Fewtrell et al. 2005). As touched on above, we also know that rainfall and variations in temperature have an impact on the types of pathogens – bacteria, protozoa, viruses and helminthes – that cause diarrhoea. For example, cholera spreads when there is higher rainfall in coastal regions at particular times of the year (Colwell, 1996), while rotavirus infections are most commonly associated with winter diarrhoea (increasing in frequency during the drier, cool months), and bacterial diarrhoea tends to peak during the warmer rainy season (Kale, 2004). Drought and low water levels can also have indirect impacts on diarrhoea incidence. The most obvious example of this is lower crop yields due to crops that are dependent on rainfall. We saw this first hand during the ColaLife trial. The crop yields were poor in the year of the trial. Because families in our project districts largely depend on agriculture for their livelihoods, there was an impact on food security. 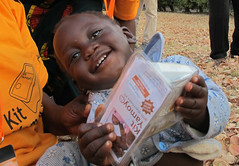 This in turn has an effect on the family’s ability to practice good prevention – accessing safe food and water. It is clear then how the nutritional status of children can be compromised under this scenario. We already know well the cycle of how stunted children are more susceptible to diarrhoea (Bern et al, 1992), and how cumulative diarrhoea burden (number of episodes and duration) can lead to stunting (Checkley et al, 2003; Moore et al, 2001). We know globally that rotavirus is the most common cause of severe diarrhoea, responsible for about 28% of cases (Fischer-Walker, 2013). Based on the epidemiological evidence above, and the pattern seen in the graph above, we would expect rotavirus to be one of the main culprits in Zambia as well. Could using a preventative method to stop water borne diseases and diarrhoea not help all year round? A simple but effective product known as the jompy which allows the user to boil their water at the same time as cooking drastically reducing fuel consumption as two tasks can be carried out at the same time cooking and boiling water. 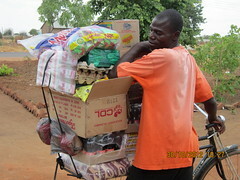 This would allow the communities to ensure the water is clean to drink which ever source they receive their water from. Thanks for your comment. Yes, contaminated water is a key source of diarrhoea infection and if everyone had access to clean water then diarrhoea incidence would fall dramatically although it would not be eliminated and so there will always be a need for a means of treating diarrhoea. We are focussing on the latter, others are working on the prevention side (and have been doing so for decades). It seems to me, too, that the jompy – while a great technological innovation – does not actually solve the problem that ColaLife seeks to address. The issue is not one of good technology. We see that ORS is good technology. Cheap. Easy to use. Totally effective in cutting deaths from diarrhoea. Zinc is a good technology. Cheap. Easy to use. Totally effective in preventing diarrhoea re-occurring. The jompy is cheap. Easy to use. Effective in cutting down water-borne disease in the household by making it easy for people to boil water. If no one in rural Zambia can get a hold of ORS, or Zinc, or a jompy, then their relative cheapness, easiness, and effectiveness is totally meaningless. The reality is: technological innovation without systems innovation is a waste of time. You can have all the best, easiest, cheapest stuff on the planet, but if it cannot get to where it needs to go and if the system of getting it there cannot be sustained, then it matters not one whit. Polio is almost eradicated because the innovation was not just in the development of the vaccine…it was in its delivery: oral administration, lack of need of trained health care workers to administer it, the interest of Rotary clubs and the role of Rotary clubs in annual campaigns, the ability to produce it in large volumes to bring prices down, the ability to confer passive immunization. the existence of polio vaccine vial monitors to demonstrate whether the cold chain has been broken. It all this stuff that makes oral polio vaccine successful. The issue is – and what ColaLife seeks to address – seeing these “delivery challenges” as not secondary to the development of good technology (“build it and make it cheap….we’ll figure out the details later!”), but rather as primary. Figuring out the details later has proven repeatedly to not work. Access cannot be a secondary detail. The jompy its a great thing. But unless the people who developed it simultaneously thought of a means to a) manufacture it to the scale that people in resource poor settings would need/want/demand it; b) move it to where it needs to go consistently and sustainably; c) convince people (notably, women…who would be asked to change the way they cook for their families) demand it and, most importantly, to use it in lieu of alternatives…then there is no point to the jompy.